Daily Prompt: Green-Eyed Monster | The Daily Post. Photographers, artists, poets: show us GREEN. In Ohakune, there is an eclair shop that is only open in the winter season – yes, I know: I should have taken a photo of it when I was there – it sells the best eclairs and lamingtons for hundreds of kilometres in any direction. 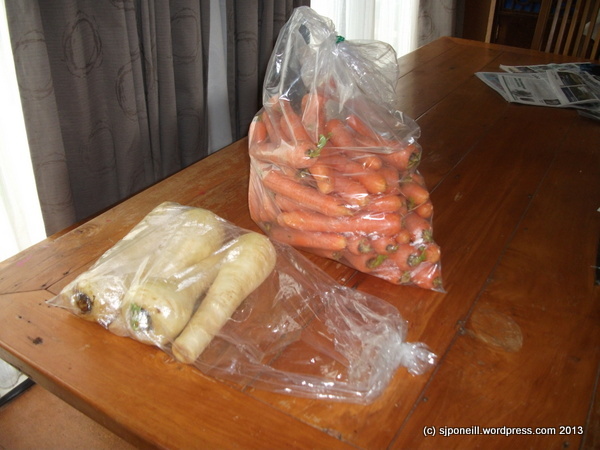 It also sells really cheap big bags of carrots (well, it IS ‘Kune) and parsnips. I spent a couple of days in civilisation – Palmerston North, anyway – last week to catch up with what’s happening at Massey University (oh, OK, then…return overdue library books!) and Hawkeye UAV; acquire some Tamiya XF-4 Yellow Green paint for a couple of projects from Mr Models, and get a long overdue haircut…I took the slightly longer route home through Waiouru and ‘Kune so that I could stock up on some fresh vegetables from the Eclair Shop. This entry was posted in Masterchef Raurimu, Photography and tagged Daily Prompt, New Zealand, raurimu by SJPONeill. Bookmark the permalink.